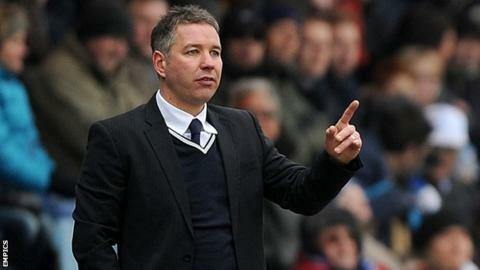 Peterborough United boss Darren Ferguson has said he is determined to not become a League One manager again. "The players should enjoy the challenge of trying to keep the club up. The difference between this league and the one below is absolutely gigantic. "I don't want to be a League One manager and I won't be next season," Ferguson told BBC Radio Cambridgeshire. Asked to clarify his position, Ferguson insisted he would not leave London Road should Posh go down and the comment reflected his resolve to keep Posh in the Championship. "I don't want to be a League One manager, the players know that. "The players don't want to be League One players. You want to stay in this league. "It's a fantastic league and we've still got a fantastic chance of doing that," said the 41-year-old Scot. Ferguson has twice taken Peterborough out of League One - in 2009 and 2011 - and succeeded in keeping the club in the Championship last season. But Posh have followed successive wins over Leicester and Millwall by losing back-to-back games and travel to in-form Blackburn on Saturday. "This is the most important part of the season," Ferguson added. "We've got 13 games to go and quite possibly we might need to win nearly half of them. It's a big ask - but I know we can do it. I am 100% convinced we can do it."